While mainstream industry and government focus on individual, home and business ownership and use of new ICTs, there is a quiet revolution going on as computers, and all their applications from games to the Internet, move into public spaces. There are commercial kiosk systems in the streets and malls, and many government projects to empower communities and stimulate the local economy, but perhaps the most important, overlooked and oft-derided development is the cybercafe. The cybercafe is a cafe or shop open to the public, where a computer can be hired for periods of a half hour to access the Internet, write a CV or play a game. With the explosion in the use and profile of the Internet and personal use of new information and communications technology—‘multimedia’—cybercafes have become part of contemporary culture, established among the public places of modern cities, towns and villages around the world. In December 1999 an on-line cybercafe guide listed 4,397 cafes around the world.1 There is very little research on what these cybercafes are used for, who uses them and why.2 This study, conducted in 1998 (Stewart, 1998), addressed the use and users of three cybercafes in the same city, the reasons and manner they were set up and developed, and the role cybercafes play in the general development of use and knowledge about multimedia. What emerged was that cybercafes are not only sites for technical access and consumption and use of multimedia content and services, but also public, physical, community and cultural spaces. 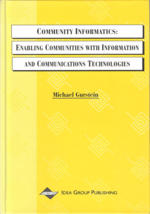 In this context I challenge the view that computers either undermine the community, or are only relevant to the formation and activities of ‘virtual’ communities.